To Orwell’s mind, at least, there was a clear distinction in the autumnal months. October was a time of golden trees, windless, misty mornings; a time when all the corn was cut and stacked and some of it already threshed in the barns. His two associations for last month – elms rising up through the mist and utterly windless days – carry something of an air of romance, and perhaps it is little coincidence that in Animal Farm the glories of The Battle of the Cowshed are played out in mid-October, a subtle high point before the onset of winter. November follows on its heels, to Orwell a more abrasive character. And the first of his associations I have had to photograph this month is ‘raging gales’ which is once again a meteorological rather than social observation – a fact that underscores how, like many Englishmen before him and since, Orwell thought first of all of the weather. So I spent the first few weeks of this month with an eye on the weather forecast. As we’ve recently marked the 25th anniversary of the Great Storm (which damagingly for Orwell’s theory landed square in the middle of October), there’s been a bit in the news about the modern evolution of forecasting. Today 500,000 bits of information will be fed into the MET Office computers each day from devices about the world. In turn these computers will formulate 133,000 predictions of expected weather, an avalanche of mathematical equations that are simplified and presented hourly on the television for us all to absorb. I was watching one of these forecasts at the beginning of last week, which showed that a depression was sweeping in from the Atlantic and that it was going to be preceded by some violent winds, most of all in the West Country. It seemed like too good an opportunity to miss. 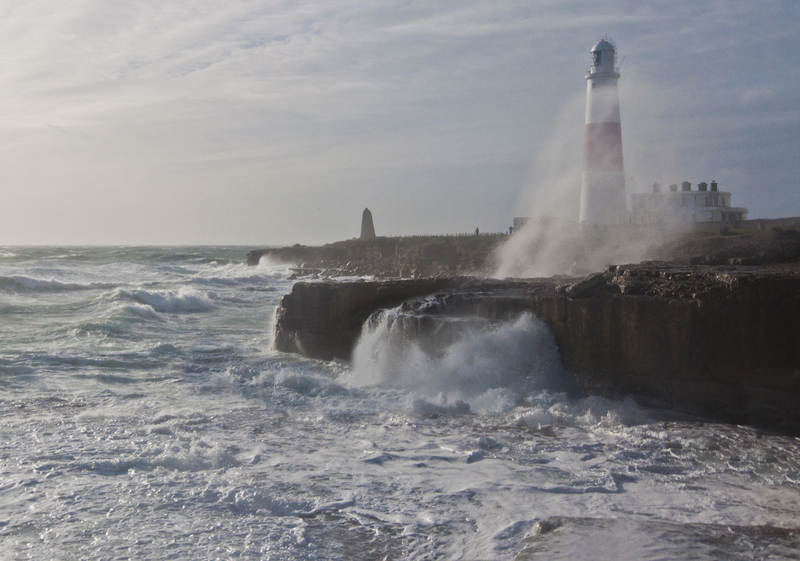 And with a trip to see @tmowlam in Weymouth a good few years overdue, I thought I’d try and get a shot of Portland Bill – just down the road – being lashed in the gales on Thursday morning when the winds were supposed to be strongest. Well I can testify to all of that. The photo above was taken of Portland Bill during a brief spell of sunshine at around midday, with me darting out from behind a protective ring of rocks and taking a few shots in the second or two before my camera (and me) were drenched in the spray that was crashing all around. It’s taken with my 10-24mm lens zoomed in, with the ISO up a little to 640 to allow a faster shutter speed of 1/1600th of a second at an aperture of f8.